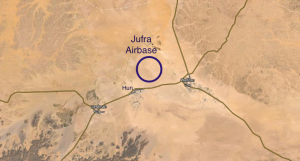 Libyan National Army (LNA) units moved into the Jufra airbase this morning after it had been abandoned first by the 13th Brigade (formerly the Third Force) and then by the Benghazi Defence Brigades. The LNA said that seven 12th Brigade soldiers were killed in the fighting with an eighth casualty from a supporting unit. It is unclear how many Misratans and BDB members became casualties or were taken prisoner. Their withdrawal appears to have happened as LNA units began to surround the base following up quickly on their successful attack on Waddan. Libyan commentator Mohamed Eljarh said today: “Winning & securing Jufra will be a major development and will shift in the balance of power in central and western Libya”. The LNA said that armed forces commander-in-chief Khalifa Hafter had saluted all units that had taken part in the Jufra attack. He had also praised the locals for supporting the LNA and “congratulated them on being freed from terrorism”. Jufra has been held by the BDB for over a year. Last December in the wake of the LNA’s capture of the four Oil Crescent export terminals, its warplanes began airstrikes on the base and surrounding area. Today’s advance was preceded by more overnight air attacks. Among the LNA images to come out of the newly-occupied air base was footage of the former 12th Brigade commander Mohamed Ben Nayel speaking to the camera from the middle of the runway and hailing the victory. Nayel resigned last Monday and was succeeded by his deputy Brigadier General Abdul Hadi Bouzid . It is unclear what he was doing in Jufra. Yesterday, after Waddan had fallen, LNA spokesman Colonel Ahmed Mismari said that the next objective would be Bani Walid, some 350 km to the north-west of Jufra.